Home > Books > Computers Don't Byte! Computers Don't Byte! contains instructional primers on computers and how they work. This publication provides lots of information with follow-up activities that motivate students without overwhelming them. Through a variety of activities, students learn computer basics and their many applications. About LINDA PEREIRA (Author) : LINDA PEREIRA is a published author. 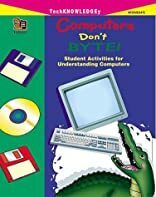 Published credits of LINDA PEREIRA include Computers Don't Byte: Grade 5-8.